I don't usually post the date in the title of The Beer of the Week, but due to vacation, some Internet issues while away, plus I forgot my mouse so doing anything using the touch pad was much slower and more frustrating, I got behind. So it's time to catch up! On Sunday, July 29, Teena and I spent a half day in St John's, Newfoundland, before heading off to Saint-Pierre and we had the opportunity to stop into Yellowbelly Brewery and Public House. This was exciting for me, as I heard they have great beer and I have not yet done a beer from Newfoundland. From the sounds of it, this was not an easy job to open this brewery. I read that it took over five years to renovate the building and open the brewery. Finally in July 2008, owner Craig Flynn with brew master Liam Mckenna opened the brewery. Well the building itself is very historic, being re-constructed after the first major St John's fire back in 1846. The building was originally built in 1725. Most buildings of the time were built out of wood, so to ensure their building could withstand any future fires, they built this one out of brick. Good thing too for in 1892 was the second St John's fire which burned most of the city to the ground. To see the map showing the massive area of destruction this fire created makes you wonder how only three people died. One of the only buildings that survived was the building that Yellowbelly currently resides in. There are tours to the basement, which we couldn't fit into our schedule, where you can see preserved the blackened beams where the fire tried to creep through. So there were five floors to renovate, plus a brewery and kitchen to create, and it all looks spectacular. I can see why it took so long! So why the name Yellowbelly? Irish immigrants used to fight in the streets of St.John’s, just like the movie ‘Gangs of New York’ portrayed. One such group wore a yellow sash around their waist and were known as the the Yellow Belly’s. Craig, thought the name was catchey and paid homage to a piece of the past. 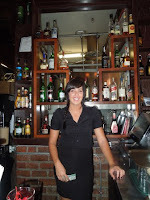 It was a quiet Sunday afternoon which gave Teena and I a chance to talk with Emily, who was looking after the bar. 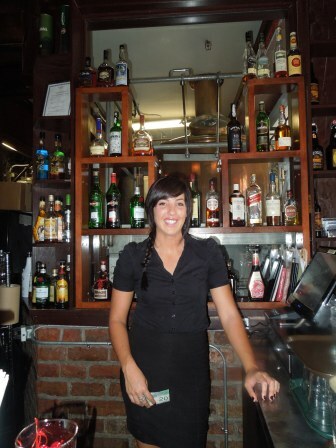 Emily looked after us very well and was very enthusiastic when speaking about the history of the bar and the beers they serve. Besides working there, she is also a rower, practicing twice a day at 5:30am and 6:30pm each day ... and I find two fencing practices a week rather hard! She and her team were competing in Wednesdays St John's Regatta. I hope she did well. It pours amber in colour and is filtered. There is a nice hop aroma to the nose. This is a very nice pale ale! It is not overpowering in bitterness and feels more like an English Bitter. There is a nice long hop finish but one that is not over the top. Now this is the beautiful part. It weighs in at only 4.5% APV. How sweet is that? A beer with loads of taste and sessionable! When not having this at the bar, you can bring it home in 750 ml bottles. After returning to St John's, I went down and bought six. As we didn't spend much time in our room, for of these came home with me. Only three are left now, as I am having one as I write this ... and enjoying it. Might be another gone before this evening's through! If you're in St John's, it's worth it to stop in at Yellowbelly! Now only one more province left to try and that one is P.E.I!